Background: Paraoxonase 1 (PON1) is a paraoxonase, arylesterase and lactonase associated with protection of lipoproteins and cell membranes against oxidative modification. Objective: Based on antioxidative properties of PON1 and significance of 1,3,4-thiadiazoles in pharmaceutical chemistry, herein we aimed to evaluate the potentials of 1,3,4-thiadiazole derivatives as PON1 activators. Methods: 2-[[5-(2,4-Difluoro/dichlorophenylamino)-1,3,4-thiadiazol-2-yl]thio]acetophenone derivatives (1-18) were in vitro evaluated for their activator effects on PON1 which was purified using ammonium sulfate precipitation (60-80%) and DEAE-Sephadex anion exchange chromatography. Molecular docking studies were performed for the detection of affinities of all compounds to the active site of PON1. Moreover, Absorption, Distribution, Metabolism and Excretion (ADME) properties of all compounds were also in silico predicted. In silico molecular docking and ADME studies were carried out according to modules of Schrodinger’s Maestro molecular modeling package. 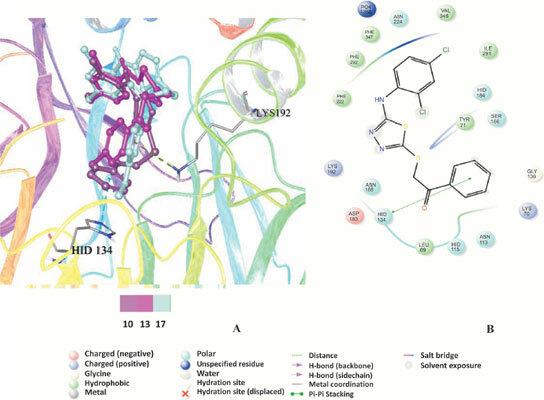 Results: All compounds, particularly compounds 10, 13 and 17, were determined as promising PON1 activators and apart from compound 1, all of them were detected in the active site of PON1. Besides, ADME results indicated that all compounds were potential orally bioavailable drug-like molecules. Conclusion: PON1 activators, compounds 10, 13 and 17 stand out as potential drug candidates for further antioxidant studies and these compounds can be investigated for their therapeutic effects in many disorders such as atherosclerosis, diabetes mellitus, obesity, chronic liver inflammation and many more. Keywords: Paraoxonase 1, thiadiazole, molecular docking, ADME, antioxidant activity, PON1 activators. Keywords:Paraoxonase 1, thiadiazole, molecular docking, ADME, antioxidant activity, PON1 activators. Abstract:Background: Paraoxonase 1 (PON1) is a paraoxonase, arylesterase and lactonase associated with protection of lipoproteins and cell membranes against oxidative modification.